"You see, I am French, so I like revolutions — peaceful ones." Benoît Rolland sits in the studio of his Boston house and fingers a bow case excitedly. Inside sits a bow with the redesigned Galliane™ frog. The first time he revealed it — to Boston Symphony Orchestra concertmaster Malcolm Lowe — Lowe returned to the house the next day with a bottle of Dom Perignon, by way of congratulations. When Francois-Xavier Tourte finalized the now-standard classical bow around 1790-1810, the introduction of camber and a wider hair ribbon were major steps toward serving a new music that required more sound and faster bowings. Musicians need yet another evolution. String players today must perform more demanding pieces for more sophisticated audiences, requiring virtuosity, unfailing stability, and speed. They play more concerts in larger halls. These requirements demand a bow that will preserve ligaments and joints while producing more sound and allowing more freedom of movement. Throughout his career, Rolland has never been quite comfortable with the ergonomics of the currently standard bow - not as a violinist, and not as a bowmaker. By making subtle changes to the form of the bow, he has attempted to remove obstacles between the artist and the music - to create an organic relationship. The new Galliane™ frog represents the most meaningful of these changes to date. When Rolland takes the bow out of the case, the difference is not immediately apparent, but soon the change becomes clear. The frog has become modernist, minimalist, sleek and asymmetrical, with clean and powerful lines. Rolland proudly recalls the years he spent crafting the aesthetics of the frog to make it as beautiful as it is innovative — it will be available in the original stark angular model or in a more rounded, Brancusi-like form, Galliane 441. This, after all, is the craftsman who after years spent designing and building the perfect workbench, refuses to use it because the drawers still do not perfectly slide. The hair no longer runs straight from the frog to the tip. 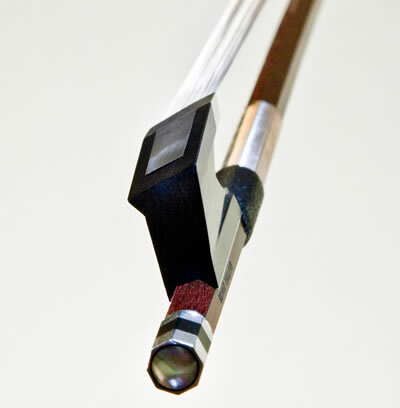 Rather, it is helicoidal; twisting from a 15-degree angle at the frog to flat at the tip, giving the player access to the full width of the bow hair without tilting the hand or wrist beyond what is comfortable in standard technique. With the full width of the hair touching the string as the new default setting, more powerful overtone sequences will be supported, and a richer sound will result with less strain on the arm and the hand. Galliane is beautiful and supported by years of theoretical developments — but Rolland's trademark has always been his close work with musicians. Their concerns, desires, and needs have driven the development of Galliane, and growing numbers of string luminaries are turning to Galliane for concert performances within orchestras, as soloists, and in recital. Additionally, many have pointed out the unique promise of Galliane within the world of string teaching. Anne-Sophie Mutter was one of the first instrumentalists to try Galliane, in an earlier evolution in 2007. While she found the idea promising, the angle of the hair was too sharp. Rolland comments: "Innovation is about having no fear of extremes, taking controlled risks. I like to push boundaries to then find where the comfort zone is that still allows a thrill of sensation"". By Summer 2012, when Benoît presented her with the less-extreme final version, she noted that it gives "the traction of a Ferrari" and is completely supportive of her technique. She has decided to acquire one of the new frogs — excited about its "wonderful sound quality." She remarks that "the bow seems to have an extremely deep and profound contact to the strings which seems to generate a fuller and healthier sound." Violinist Yumi Okada, winner of the Tokyo competition, agrees: "The new bow design offers a musician new ways to explore the instrument... I can now place more emphasis on the instrument instead, as the new bow readily conforms to my natural playing ability, and relieves me from the added pressures of maintaining the bow posture." As one of the first major tests of his new bow, Rolland invites renowned violinist and pedagogue Miriam Fried to play her Rolland and her Peccatte in two configurations — first with her standard frog, and second, with the new Galliane frog. Fried picks up the bow fitted with the new frog and begins playing long, slow, careful open-string tones. "I like the feel of the frog," she says. "I feel more control in the changes... it really seems to sit on the string more easily at the point of the switch. It has this cushion that you feel, it's much easier to build the sound, less work, more reliable." Rolland murmurs in happy assent. Fried jumps into the bravura opening of the Mendelssohn concerto. "It just is really easy. It's a rounder sound, rounder and immediate... you really center in the middle fingers and only use the index for balance, so the index finger literally just lifts off the bow." As a pedagogue, Fried predicts much use for the bow in teaching her students relaxation within sound production. "It's a really important issue... the ease of balance means I don't need to squeeze with the index finger. If you push on the index finger too much you can squeeze the sound down, and it's really significant that you don't need to press." Alexey Igudesman says that Galliane will "revolutionize violin playing as we know it." Julian Rachlin played his Galliane in concert with the Boston Symphony and conductor Alan Gilbert, and for a week of recitals in Vienna, winning critical praise from the Boston Globe's Jeremy Eichler for his rich tone and "commanding technique". And while the cello version of the frog is still in development, cellist Lynn Harrell has tried it and called it "a major step forward." Ben Miller is a writer and student at New York University, where he is a Presidential Honors Scholar. His journalism and commentary has been published in Washington Square News and NYULocal, his academic writing in Historian and Inquiry, and his creative writing in West 10th and Studio on the Square. Reach him at benmiller@nyu.edu or tweet him @benwritesthings.